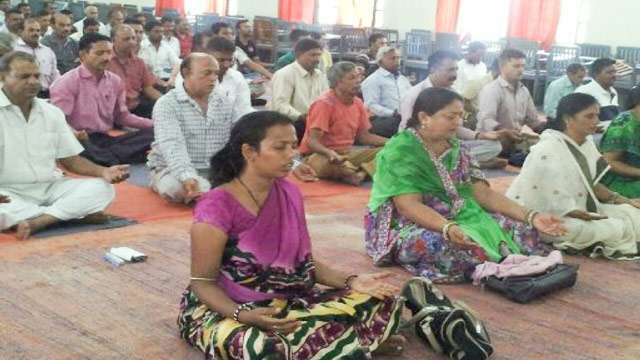 Thousands of volunteers conducted simple Isha Upa-Yoga sessions for the public leading up to International Yoga Day. Here are a few inspiring stories of transformation. 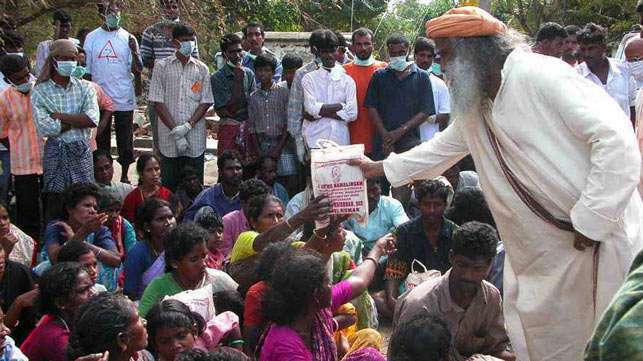 Isha volunteers are reaching out to touch lives across India, across divisions of caste and religion. Millions of lives have benefited from Isha Upa-Yoga, thanks to the efforts of these amazing people. 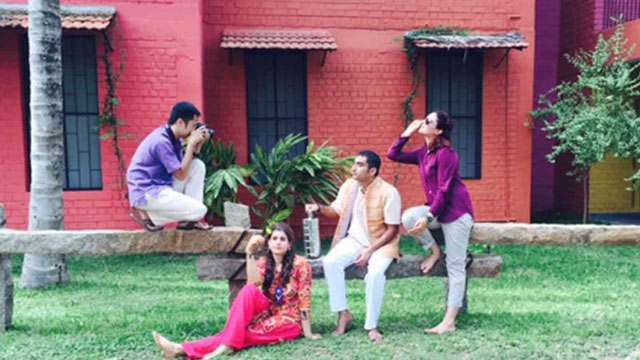 Here are a few funny, surprising and heartwarming stories from the ground for you to enjoy! #48 Goodies On the Side Plate! #41 200 Kids Waiting – Give Me a Sound Cord! #23 Magic of the Mystic! Unbelievable! #16 “I feel calm. If I meditate daily, I will become peaceful..."
#13 “Yoga will bring peace on earth..."
#9 Thank God It’s Friday! #7 “Students normally visit school for the mid-day meals..."
It was 5:30 in the morning, and many of us had gathered to do our yoga practices together. Isha meditators here in Chennai gather once a month to strengthen our practices and get them corrected. We call it “Sadhana Day”. All Isha meditators are welcome to attend this session. As I opened my eyes after Guru Pooja, in the dim light I saw a hazy figure in a full black gown. “I’ve not seen her on any sadhana days before,” I thought. Upon second glance, I understood that her clothing choice was one of faith. Slowly she came to us and shyly said, “I want to restart my yoga practices.” Without seeking any further explanation, we helped guide her through the practice. At the end of 90 minutes of instructions, practice, and correction, she opened up to us. It was beautiful to see that both husband and wife got up early in the morning at 5:00 am just for this purpose. 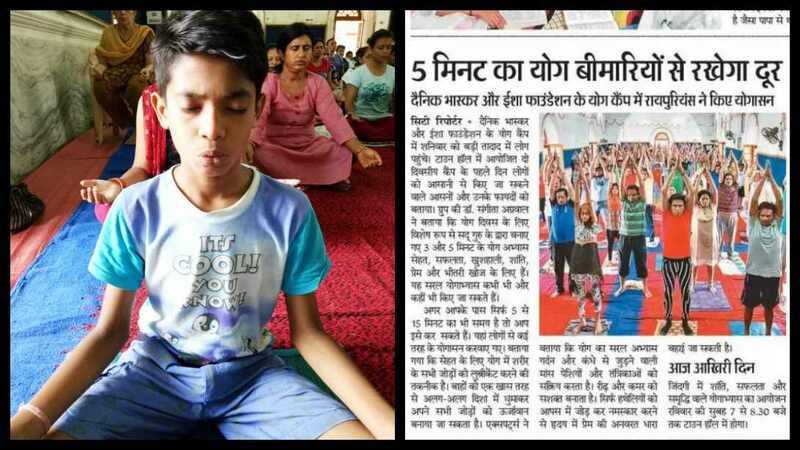 Read an inspiring and pleasantly surprising brush with the popular media during an Upa-Yoga session in Raipur. 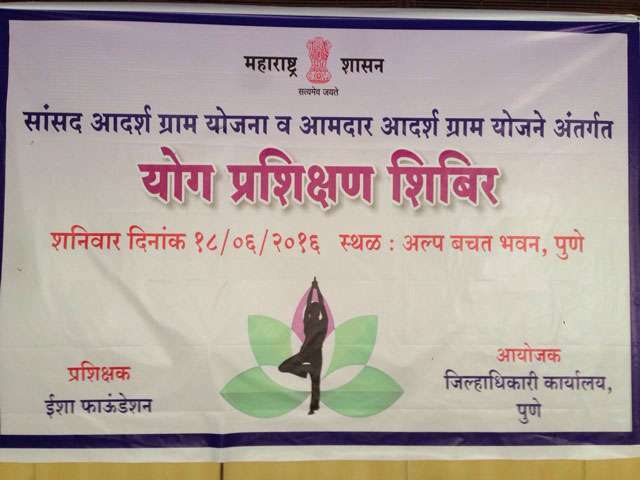 It was 18th June, 7:30 am, and the third Upa-Yoga session in Raipur was under way. I was sitting in the packed hall, fully focused on assisting the teacher. Suddenly, a volunteer sneaked in and whispered in my ears that the Doordarshan (DD, India’s national television channel) camera crew and reporters were outside to cover the session. I stealthily stepped out to greet them, and got to know their requirements. They wanted to interview me and some participants after the session, and take a few shots. I took them in quietly to shoot the event. To my surprise and delight, after the 3rd sub-section, the cameraman dropped his camera, found a place in the hall, and started doing Yoga Namaskar along with the other participants. It was totally amusing for all the volunteers to see this. At the end of the program, they interviewed the teacher and a few participants too. The session was telecasted on DD Chhattisgarh Raipur Channel, the same evening at 6:30 pm. In another incident with the media, a reporter from Dainik Bhaskar (India’s leading newspaper in Hindi) had come to take some photos. When he came for the first session, he would get up many times during the class, move around briskly and take photos whenever he thought it was appropriate – something he would do perhaps for any other event. Since he had no exposure to yoga, and did not know the discipline and other nuances of an Isha class, the teacher requested that she would signal him when he could move around in the class. But he didn’t seem very comfortable doing it that way – perhaps he thought he would miss some nice shots. The next day when we saw him again in the class with his camera, we were prepared for some ad-hoc situations. 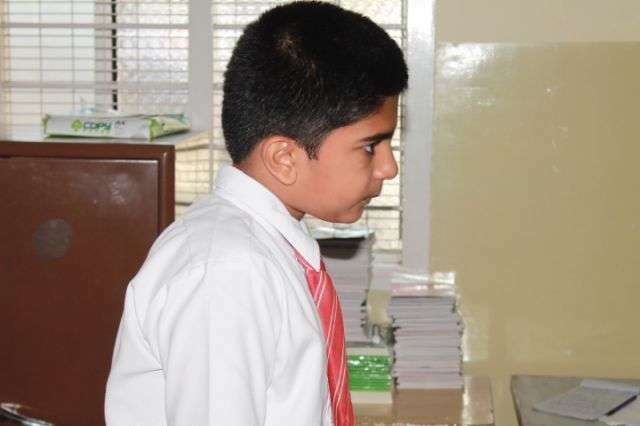 However, this time it was so different – he was listening to the videos, paying attention to what was happening in the class, and looking at the teacher before getting up. It was heartening to see this. In my experience, no one is left untouched in these classes, whether they are participants or just there for their vocation. 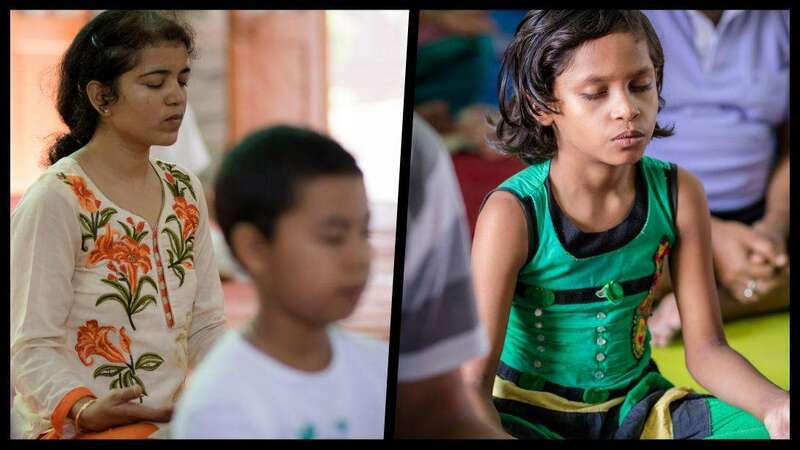 “The Upa-Yoga session at the Spastic Society was not only the easiest one we had conducted, but it was a reminder to drop my conclusions,” Vani from Chennai shares. Read a moving anecdote from her session for teachers in this disability center. A couple of months ago, I had to visit the spastic society near Ascendas IT Park, Chennai. Though it was an official visit from the bank where I work, I had some resistance entering that place – “Images of disabled children will disturb me,” I thought. However, I went there and it was really inspiring to see how committed the principal and teachers were and with how much care they were handling the children. The impression of this visit lingered in my mind long after. Last month, I contacted them again with an offer to hold Upa-Yoga sessions for the teachers in the center, as part of the IDY celebrations. The principal soon replied, agreeing to make arrangements for a session on June 17th. On June 17th, I went along with my husband and mother there at 7 am. 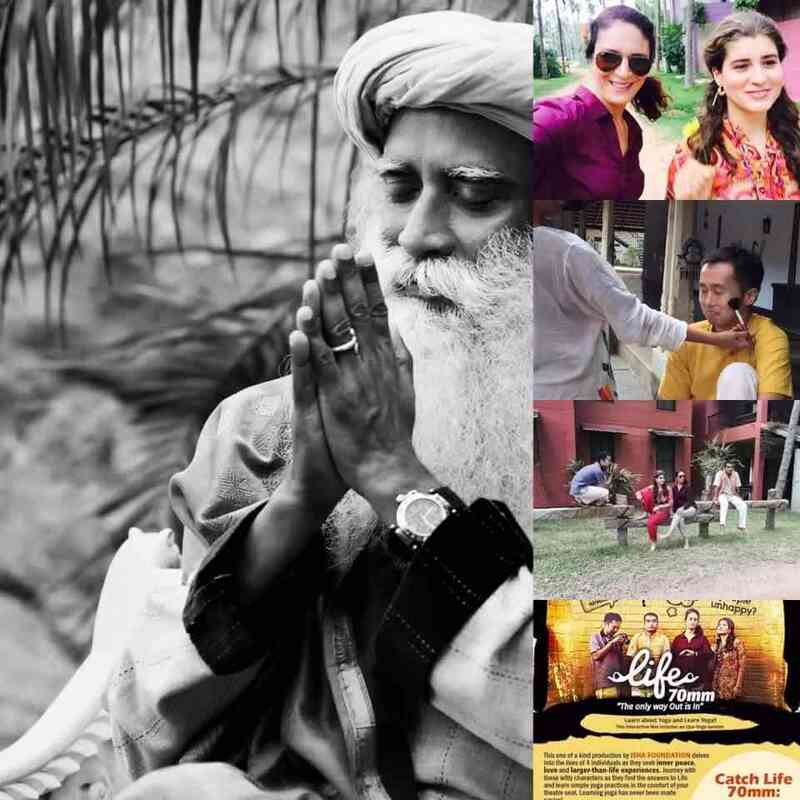 We were delighted to see everything set up as meticulously as an Isha volunteer would. Because of this support, the session started on time and it turned out to be the easiest session for us to hold this year so far. Afterwards, all 30 teachers who attended the session came personally to thank us and it was a bit overwhelming for the three of us to be greeted with so much reverence. There is one particular incident that shows how fulfilling it was for me to offer this session to them. Along with the 30 teacher participants, there was also a disabled teenage girl, who was sitting on the side of the hall with four other disabled children. She seemed like she wasn’t able to walk or perform activities on her own, and her neck was twisted visibly about 45 degrees to the side. The only thing she could do at ease was to move her eyes from side to side. She was sitting very close to the screen and I saw her moving her eyes to look at me or the screen from time to time. “Why have they made this poor girl sit inside the hall for such a long time? Poor thing, she can’t even participate in the session,” was the thought that arose within me before the Shambhavi Mudra session was to begin. In the next few minutes, I found my answer. The moment Sadhguru asked the participants to hold yoga mudra, she was the first person in the hall who adjusted herself in her chair, moved her wrists and held yoga mudra perfectly. Until then, I had not seen her move at all, and could not tell if she even understood what was happening there. It was so wonderful to see that she was participating in the class in her own way! I couldn’t hold back my tears and bowed down to Sadhguru within me, for reminding me not to make conclusions. On Yoga day in Raipur, some enjoyed not just the first Yoga class in their lives but also the first sunrise they ever saw. 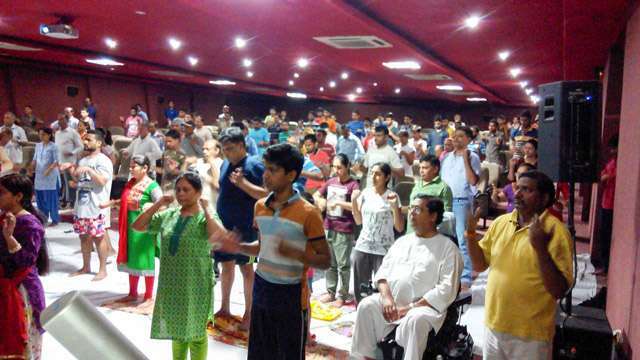 A Yoga Veera shares an interesting account of the first IDY session in Raipur. 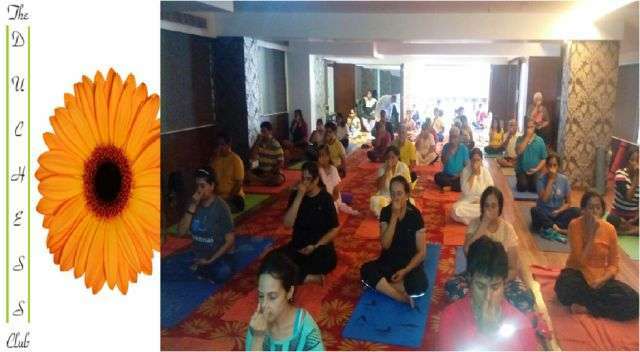 Dainik Bhaskar, a popular Hindi newspaper in India, had been publishing free advertisements for the Isha Upa-Yoga Sessions in Raipur, and perhaps because of this, the number of registrations had already crossed the hall capacity by the evening before the session. When we were packing to leave, a lady came to us hurriedly asking us to register her for the next day session in the town hall. We politely explained to her the situation, and gave her the option to register for the subsequent session on June 18th. “No, please let me be in this session. I will sit outside if there is no place, but please register me for this session,” she insisted. Her keenness to do this simple yoga was very touching, and we of course registered her. The next day, the hall was brimming with a variety of people - above 65 years, below 12 years, society ladies, domestic help, young girls and boys. They all participated in the session with a lot of involvement. Many were eager to do more, and registered for the upcoming Inner Engineering program in Raipur. Most copies of Isha Lahar and the book Jo Chaho Vo Palo were sold out too! Later some shared that the session was unique, and had touched them deeply. Interestingly, a few shared that it was the first time in their life they had seen a sunrise and it was worth it. However when I heard some say that they had not even heard the word “yoga” before, it seemed unbelievable, but sadly true! It is heartbreaking to see that even Indians have lost touch with their most valuable heritage. I feel privileged to carry the torch of Yoga in whatever minuscule scale my contribution may be. - B K Gupta is a Yoga Veera and an industrialist based in Raipur. 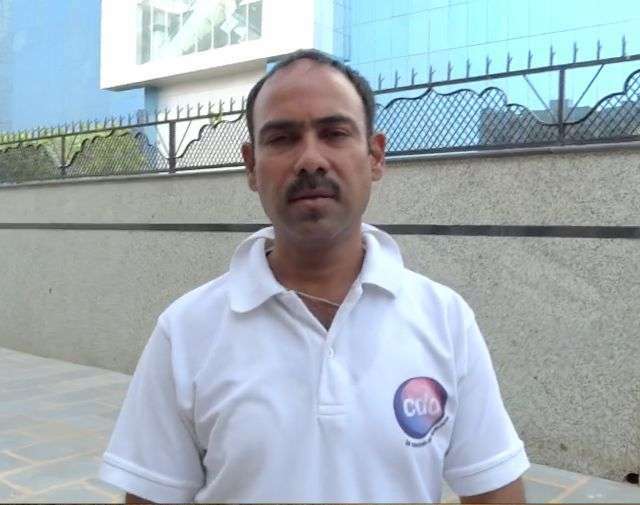 He is also the secretary of Urla Industrial Association, a renowned business association in Raipur. These are the times of quantification, of empirical proofs. So here is my attempt to show why I find Upa-Yoga practices and Shambhavi Mahamudra miracles in their own right. 2: My sleep quota has reduced by almost 2 hours – I am energetic throughout the day with just 6 hours of sleep daily. 3: I used to get headaches after travelling for even short distances​​. Now I drive 30 km on my motorbike in the hot afternoon every Sunday to volunteer for a water camp. All these benefits have accrued after just 2 months of practices. However, I feel these are all just the side effects of what I truly gained. I am joyful with a sense of responsibility and awareness. I feel extremely lucky to be a contemporary of Sadhguru. I was to conduct an Upa-Yoga session at the Border Security Force (BSF) camp at the Haryana border on May 22, 2017. The excitement of conducting the session started a day before, when I had to practice and learn the Hindi script, and recite it to my wife. I am not very fluent in Hindi, so it took some amount of involvement. On the day of the session, I saw that almost all the participants were BSF soldiers – agile, well built, and full of energy. It looked like the soldiers were coming in from the grounds, right after a game. 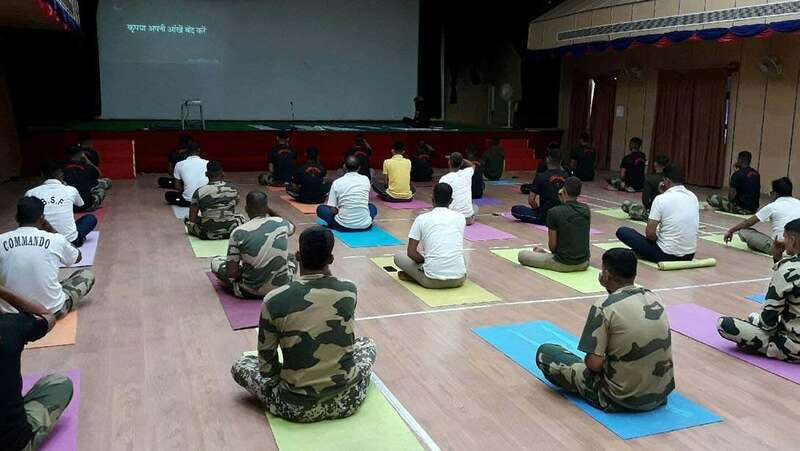 Many of them were seated as the session was about to start, but several soldiers just came in and started doing some difficult asanas like "Shirsasana" and "Chakrasana" on their own even before the program began. The beautiful sound of Yoga Padi that usually calms participants down before a program seemed to have no effect on them! Not knowing what would be the best thing to do now, I just went behind the microphone and sat in Ardhasiddhasana with my eyes closed. Within a few seconds, all the soldiers settled down, just as they saw me sitting. In those few seconds, a profound realization of the depth of what I have been empowered to do via these Upa-Yoga sessions took over me. I had no idea that I can induce so much change in someone else, simply by sitting with my eyes closed! I was filled with gratitude towards Sadhguru and all that I have learned in Isha in the last 3.5 years. - Rohan is an IT professional and works with Arvarto in New Delhi. He has conducted 15 Upa-Yoga sessions since 2015. Rohan was one of the four volunteers who went to the BSF Camp to conduct Upa-Yoga sessions. They conducted 12 sessions in 6 continuous days at the camp. I have an examination coming up on the 18th and a friend asked me if I was anxious about it. This got me thinking of the time when I was preparing for my 10th grade examinations. My parents, teachers and well-wishers had told me that if I worked hard that year, my life would be a cake walk then on. Funnily, I heard them say this before exam after exam, year after year, and I kept working hard. Now I am a Post Graduate from a reputed institute, but still no cake has appeared before me to walk upon nor did my life get any better. Whether I pass the exam or not, whether I am economically and socially successful or not, I am going to carve out a niche for myself because now I am well engineered within myself. On the other side, being a sensitive child and now an adult, I could see that my doing well academically and focusing only on my individual material success, would not bring wellbeing for me. I wanted to do something for the world, for my country - something that would make life better for millions in my country. I felt powerless as an individual and resigned to a place where I thought it’s good enough if you pass through your life without harming others. But it was not working. I had to bribe people to get simple things done, knowing very well how it destroys the very fabric of the nation and hence of the future generations. There was a friction outside and that filtered into my mind. Simple life situations started to take a toll on me and incapacitated me in a big way. From a reasonably joyful child, I turned into a grumpy adult. Then one day, I got a mail from my brother, which also had a Mystic Quote attached. Below a picture of Sadhguru, the quote in the mail said, "For a committed person, there is no such thing as failure – just lessons to be learnt on the way." It wasn’t just the quote that touched me, but rather Sadhguru - the way he dressed, sat, and looked, drew me in immensely. I enrolled for Inner Engineering simply out of enthusiasm, even though I was involved with other spiritual organizations at that time. I went through Inner Engineering and it has been my refuge here and beyond. I have come to realize that there is so much more to life than just doing well in examinations. I now feel empowered, not just for this crucial 3-hour exam, but also for life. Whether I pass the exam or not, whether I am economically and socially successful or not, I am going to carve out a niche for myself because now I am well engineered within myself. 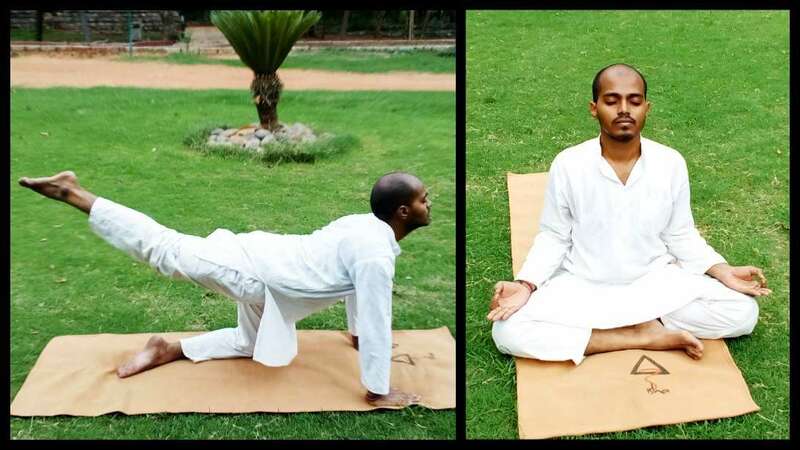 – Ravikumar Koyyala, will be giving his UPSC or Civil Services Exam on 18th and will be conducting two Upa-Yoga sessions each day on the 19th and 20th for customs officers. 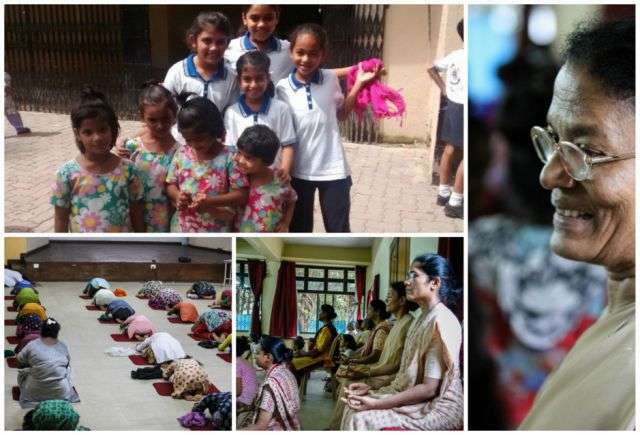 On the International Day of Yoga, the day all the volunteers have been waiting so eagerly for, we went in search of the school where the session was to be conducted. After much struggle, we located the school and to our surprise, we found that the children had left school for the day. The only person we could spot was an old lady staff member. We introduced ourselves and Sadhguru to her. She promptly recognized Sadhguru and said, "Oh, the Guru who has a long, white beard. I have seen him once on television explaining why women should not enter the Shani temple. I was looking at him incessantly." She was visibly amazed by the clarity of Sadhguru's talks. Hearing this from a Marathi municipal school teacher in Mumbai left me overwhelmed. I consider myself very fortunate to have met Sadhguru and privileged to have taken the tools of well-being to schoolchildren, who I feel need them the most in today's stressful and competitive environment. 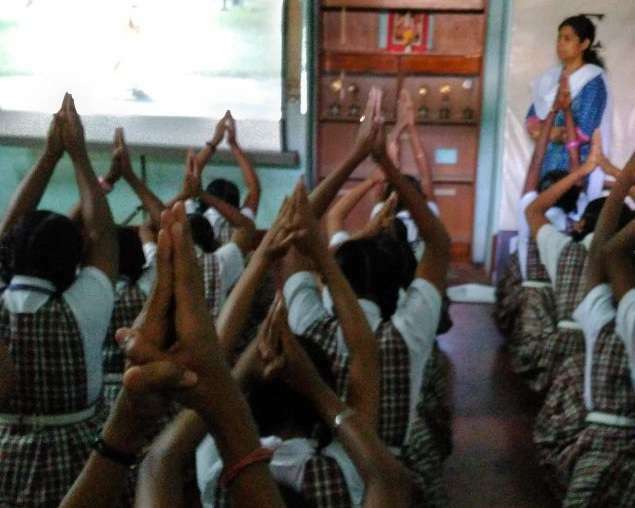 The classroom where the Upa-yoga session was to be conducted was packed with 84 young, bright students. Their eyes were curious and the excitement in the air was palpable. I was one of the fortunate trainers in the city whose computer systems (virtual classrooms) did not have any technical snags and functioned smoothly. Though I did not have high hopes from the school staff for the Yoga session, their support and enthusiasm exceeded all my expectations and left me perplexed. Above all, the students were more disciplined and attentive than the kids of a secondary school in Mumbai are. They asked me to join them for the mid-day meal, and I gladly took it up. Though the meal was quite meager, just to sit and eat with these simple and humble children was a treat in itself. 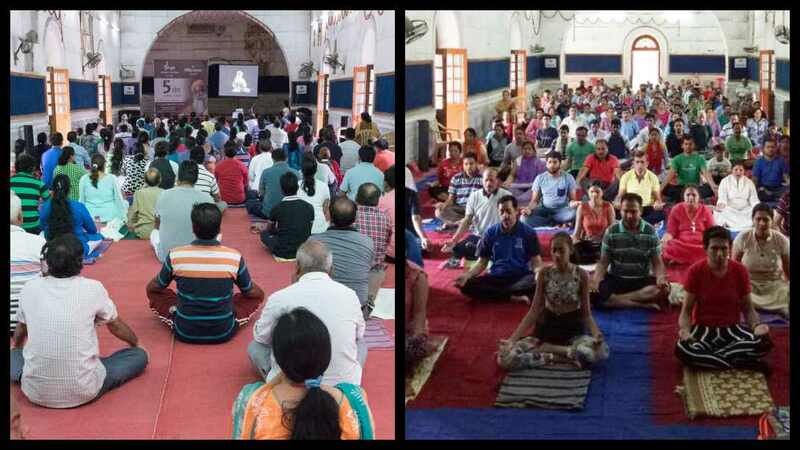 These Upa-yoga sessions also cured me of my fear of facing large crowds and inattentive audience. I wish to express my gratitude to Sadhguru and Isha for allowing me to take the tools of transformation to the young generation which will shape the future of humanity. Yoga, it happened to me! Just like Newton’s apple. It was a calling, but more like a big, hard knock on the head. All my lifestyle extravagances had finally caught up with me. The fact that I was leading an extremely unhealthy existence never occurred to me till I delivered my daughter. After undergoing the pain of a very difficult delivery, I felt my life was falling apart. I was diagnosed with a slipped disc, severe anaemia, osteoporosis and my entire system was extremely vulnerable due to low immunity. And, of course the very common - post-natal depression. I was 31, very clearly on the wrong side of thirty. My doctor asked me to choose between spinal surgery and Yoga. It was time for some cleansing and healing. I promptly chose Yoga. I immediately resigned and took up Yoga professionally. My teachers at The Yoga Institute in Mumbai (one of the oldest in the world) became my guiding lights. The institute was my sanctuary, nestled amidst the greens, far from the chaos of Mumbai's hustle and bustle. I started practicing yoga intensely and this knowingly fired up a longing beyond health and well-being. It was difficult to articulate this longing. It was a thirst which neither the daily chores nor Yoga could quench. Then I met Sadhguru. I am not sure if I found him or he discovered me. 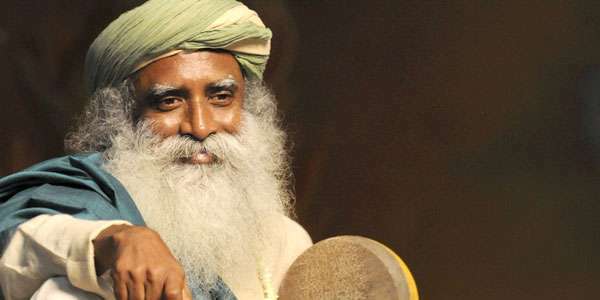 Sadhguru, my guru, the person who changed my life for the better. Looking back, I am privileged to have met him and walked this path through his guidance. Today, as a perpetual student, practitioner and teacher of Yoga I feel privileged and humbled. Yoga has not only worked miraculously for my health, but has also transformed me into a better human being. The latter, however is an incessant work in progress. Without making the International Day of Yoga sound frivolous, I urge all my friends to embrace yoga, not just for a day, a month, but as full fledged, lifelong, passionate love affair. And in my Guru's words - Don’t wait for life to knock on your head! When I first heard about the movie, I wasn't quite sure if many people would spend Rs. 100 to watch a movie on Yoga. To my surprise, the show was almost sold out. The hall was packed when we entered, and the audience had started to clap and cheer loudly for the movie to start. We too joined in the chorus joyfully. The movie was amazing - the cinematography, locations selection, background score, the angles - everything seemed on point. I really enjoyed watching the actors (who apparently have no prior acting experience) and still played their characters well. I'm sure each of us could relate to at least one of them, if not to all, in some way. Watching Sadhguru on the big screen was Magical. I was deeply touched watching the 'Namaskar' video on a big screen. Most unanticipated moment was when we had to get up and do the Upa-Yoga practices then and there! It was wonderful to see all standing up willingly to do the practices. I'm sure that for many people, this was a brand new experience - an interactive movie experience! What a lovely, innovative approach to reach out! We reached Sarvoday Balika Vidyalaya, Malad, a government school, at 1:45 pm to hold a session for 200 children. Since we were there much before the time, the teachers were happy to reschedule the session to 2 pm assuring that the hall and AV systems were ready as per our instructions. But when I checked the laptop and audio, I realized the laptop didn’t have a CD drive and had very little RAM to play the video smoothly. Luckily, I was carrying my laptop and decided to use that instead. ‘Now everything is in place,’ the teachers said joyfully and without any further suggestions from us they brought the children into the hall. We got buried in chirps and giggles of these children. Soon we discovered that they didn’t have a sound wire to connect the laptop with the sound system. I quickly requested them to wait, and we both, Jeenay anna and I, rushed outside in different directions to buy the sound cord. Soon, I located a shop, and I called Jeenay anna to go back and be with the children. To my dismay, the shop owner was rather lazy. He was busy counting money and for a long time (at least to me it seemed a long time), he didn’t even look at me. I finally rattled out the situation – IDY, yoga, 200 students, no wire, so on and so forth. Finally, the shop owner asked me what I needed and gave the wire after much explanation. I ran to the hall. The session started at 3 pm, on-time as scheduled before. Rest went wonderfully well for both us and them. 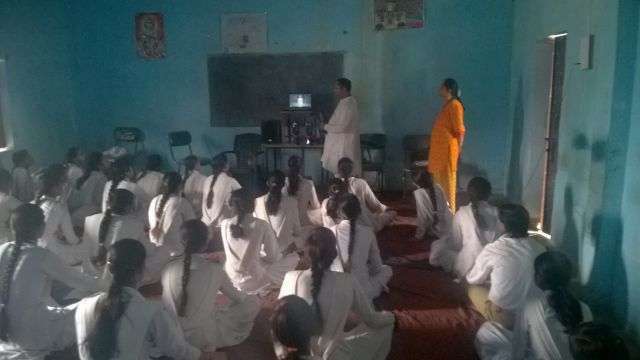 The Father who runs the Tech Mahindra Foundation, a charity organization that trains youth from lower economic backgrounds into employable skills, agreed to hold a Upa-Yoga session for the students. 150 students sat in 5 straight lines. The Father honored me with a shawl and a student honored the other volunteers and we began the class. Within minutes, the class was silent and all seemed absorbed in getting instructions right. During the Nada Yoga and Yoga for Inner peace, I particularly noticed that most kept their eyes closed, held perfect mudras, and seemed to be drenched in silence within. After the session, they opened up and a few shared their experiences exuberantly. While many asked about Inner Engineering and Isha, a young boy from an underprivileged background approached me shyly and asked if he could get the song that Sadhguru sang in the CD. This was the first time in these sessions that we had someone who was so touched by Sadhguru’s voice and the melody. A small lane adjacent to a Vinayaka temple just before Kalakshetra leads to a Home for Orphaned Boys taken care by the group Kakkum Karangal. The house was refurbished into a mid-sized hall with a TV room, dressing room and kitchen upstairs. There was a dump yard of old donated clothes and many other such items – not usable by normal standards. I was waiting for the other two volunteers; most children were taking an afternoon nap while some were playing carom. Finally, we started the session by 4pm with the children, all below 12 years of age, by spacing them out at an arm distance length. Soon the noise subsided and they all aligned themselves towards the screen. They did most of the practices with involvement. As we finished, the manager came and all were made to sit in a line. I wondered if these children ever asked why they have been denied the most fundamental atmosphere of growing up – love and care of parents. They seemed to live in the present and be happy by themselves. In the end some shared their experience. Not a surprise that most liked 'Yoga for Love and Peace'. The night before we made a hectic schedule for all the volunteers to reach out to as many people as possible. Most of us had gone through just a basic training to conduct sessions and were not equipped to handle tough situations. The only tool we had was willingness and devotion. Starting at 7 AM, we went in all directions. Many schools opened their doors, and gave us the opportunity to conduct sessions in their assembly. Some schools were so impressed that they asked us conduct sessions for the teachers, as well for the students on their annual day. Many said they will include this as a part of their regular syllabus. Many other volunteers who were not trained to give sessions came forward to offer food and other things to facilitate the whole process and make it like a celebration. To top it all, at 6 AM, most of us went to see the movie ‘Life – 70 MM’. It was a magical movie, dripping in grace. Most of us were in tears while watching it. With hearts filled with devotion and love for one and all we dispersed at 11:30 PM. IDY has become like a festival to feel humble and know the profoundness of being human. Though many were working tirelessly to make things happen, till 19 June things were a bit slow. Seeing this, many volunteers decided to take 2 days off while some for D-Day planning. We decided we will go door to door and knock at every home. Rama akka, Malini akka and our team of dedicated and super energetic volunteers went around the entire town knocking all possible doors on IDY, and the rest happened like magic. We got permission to conduct sessions in most corporation schools and some private schools. The highlight was that we got permission to conduct the session during the assembly at St. Michael's School, run by the religious congregation ‘The Society of the Brothers of St. Patrick’. It’s not about the numbers but the sheer joy of being together and doing something very small towards making a difference to the way our children may grow to be. A car that sped out of the mist crushed first a young man’s bike, then his spine and later his dreams. But something remained intact: his will, which was more than enough to drive Sidhartha to glories in shooting at the national and state levels. Now this strong willed, wheel chair bound gold medallist in the National Shooting Championship, Sidharth Babu, was in the ashram to attend a Hatha Yoga program. Though he could not do asanas and Surya Kriya for obvious reasons, still he didn’t leave the hall during any session and participated fully. One participant of the 8-day Hatha Yoga program shared that he had a painful bulge in his hand because of excess use of mouse. After trying various measures, doctors recommended surgery as the last resort, which he was to undergo right after this program. Miraculously, the bulge and the pain disappeared after Upa- Yoga practices. He also shared that he had a certain condition where he had to urinate every half an hour, so he was allowed to leave the class for this purpose during the sessions. However, when he was doing his first Nadi Vibhajan, he sweated profusely. A day later, to his utter surprise, after starting the Surya Kriya, he didn’t have the rush to the toilet that frequently there after, and went only during the breaks. After acting in the movie and seeing how everything was just going so smoothly, the excitement to see the result was overwhelming. By sheer luck, I was offered a flight ticket to go attend the movie in Bangalore. The moment the screening started I knew it wasn’t just a movie. The music, the story, the interaction, the practices, Sadhguru’s appearance on the big screen for the first time - everything was a completely different experience than just watching a movie. A whole powerful presence was in the hall. Sadhguru’s voice being heard from the movie sound system was a totally different experience for me. I couldn’t stop my tears; I couldn’t keep my eyes totally open. It was like being re-initiated again. The whole thing was so mellow, from the actors’ scenes, to Sadhguru’s talks and practices. I couldn’t feel time anymore. I felt I was out of time and out of space. What added to all this was seeing people at the end of the movie so touched and impressed. 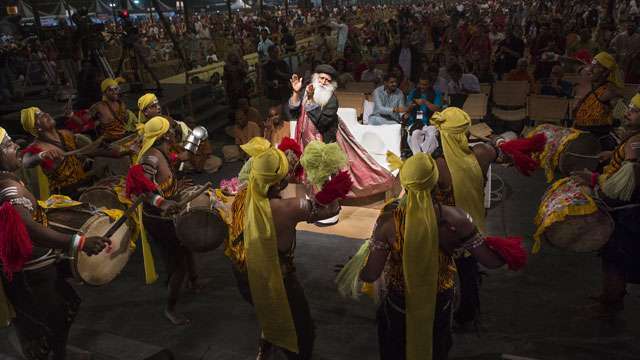 They were able to relate to the actors and feel them, the practices, and mostly Sadhguru’s talks which came across so well as there was music in the background. It was really something magical to see such ingenuity happening in only 21 days and touching so many people. And to hear everyone’s wishes to have the movie screened more and more kept nothing but a tear and a smile on my face. Sadhguru… how abundant is your Grace!!! After organizing IDY sessions for schools, government and corporates, we had an opportunity to reach out to villages in Mumbai-Pune on the 21st. Recently, on initiative of the Pune collector's office, 70 villagers from 16 villages underwent training sessions in Marathi. These are model villages adopted by different MPs and MLAs. In the run up to the session we had many logistics' issues and we were unsure whether the session will actually happen. But the way these people went through the session, it was all worth it. Many villagers traveled 100-150 km to be there, with barely anything to eat. In spite of this, they went through the session uncomplaining, simply, with devotion, and tears of gratitude in their eyes. Now they will be conducting IDY sessions in their villages from 21st, and they need our support to make it happen. “I'm really happy that I took up this opportunity when Nehal offered. I always wished that I had come in touch with yoga early in life, and this was so important that I be a support in the process of children receiving it. Children looked so adorable in every yogic posture, their faces – little serious, little funny but very cute. This work allowed me a glimpse of the insides of a BMC (Bombay Municipal Corporation) school. So different from a private one. I also noticed how physically weak so many children were. This was so different from a private school, where some children are even obese. “It made me feel like it was the best day of my life and the best deed I’ve done. No words to explain how wonderful today's opportunity was. The kids liked me so much. After the session, almost all of them came to me and asked about me, my connection with Isha. They gave me a hug and told me they like me and want me to come every day. At the end of the session, the Principal of Police Training Academy, Marol came forward to address the participants. “You are the ambassadors now who will take it to minimum 500 police personnel per person in recursive batches,” he said to inspire them. 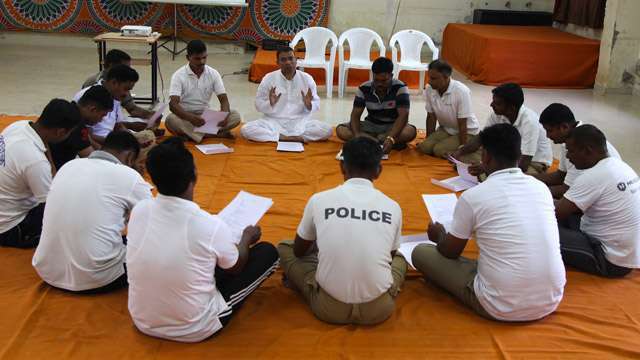 He mentioned lightly, if these policemen show interest, this skill will be considered as a special skill and this will help them to avoid their transfers as they would be retained as local Isha teachers. 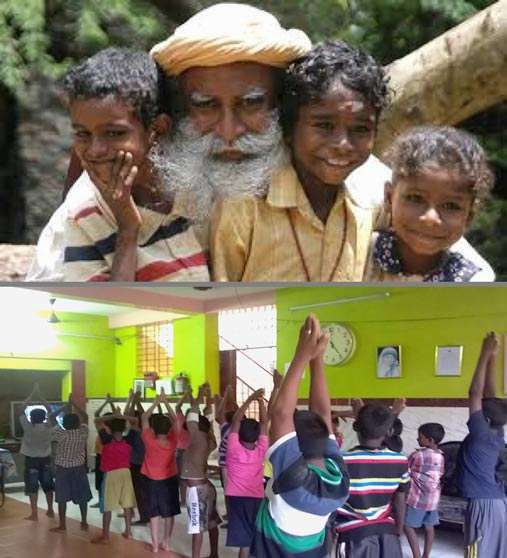 Isha Volunteers in Mumbai reached out to 100,000 children to celebrate the International Day Yoga 2016. “What a wave! It’s a tsunami!!! So humbled to see all the children quietly enjoying the sessions, listening to Sadhguru and also doing the practices... Hope this stays with them for life. Mr. Bansal, the founder of Bansal Institutions, Kota (Rajasthan), attended the sessions while sitting in his wheelchair. At the end of the session, his sharing was really inspiring. He said his experience was enlightening, the best thing that had happened to him ever in his life. We were later told that he had come out in public to attend an event like this after years. Two sessions were going in parallel in Jodhpur. I was taking session at the upper big hall. At around 12 noon one person wanted to enter the session midway. Another Isha volunteer, who was at the registration desk for the next session, politely stopped him from doing so, as it would disturb the participants therein. She was happy to register him for the next session that was to start in another one hour. When I was entering for the session at 1:15pm, a few people blocked my way and started shouting ‘Yoga Shivir Band ho’ (Close this Yoga Camp). I requested them in every possible way, but they were not listening. I kept standing aside with folded hands as there was no choice. Meanwhile another Isha volunteer came and somehow they came into the hall and sat quietly. I knew it was neither me nor anybody but Sadhguru’s grace that handled the situation. The whole session went well as though nothing had happened. Participants remained fully engaged throughout the process. ‘I am Lissie Jacob, a Christian by birth. I did an Isha program in 2014, and my life changed soon after I started to practice Isha Yoga. 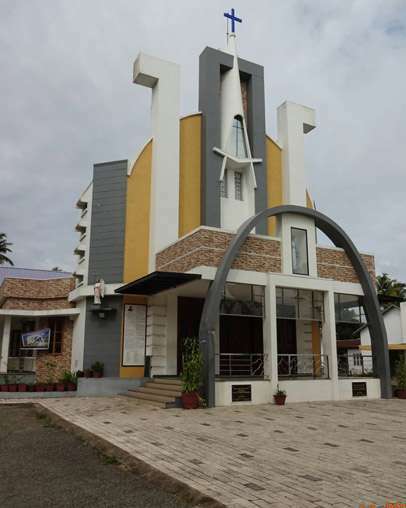 I find Isha Yoga is truly above religion and caste, and it has in no way reduced my faith in my religion,’ said my co-Isha volunteer who was going to hold a session for the devotees in the church. People listened to her keenly, and participated in the session with full involvement. The Father of the Church, a wonderful person, personally served tea and roasted peanuts to us. He had inspired many people to come for this program after hearing about Isha and Sadhguru before. One office holder of the church requested us to conduct this session again on Sunday for the students. In Kota, the morning session was unbelievable – participants were as emotional and involved as people are in Isha’s advance programs. The electricity went off, the program became delayed, the air was warm and humid without any fans or cooling system… But all this could not dampen the spirits & involvement of these people! The organizers were spellbound seeing such enthusiasm among the students of Bansal institute, and requested an evening session for their faculty as well. Kota, Rajasthan is in the zest of celebration. Like no other city in India, IDY in this city is being celebrated as a big festival. The skies are lit with fireworks, drums are being played in various streets, children, teens, adults can be found dancing. It is so wonderful to see, ecstatic people lighting the sky to welcome the Day of Yoga, a light within. Last year I had a major surgery and spent months hospitalized. Later on I was only able to move around in a wheel chair or on crutches. 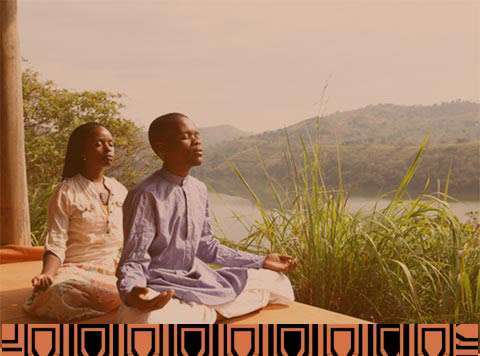 I attended the Inner Engineering in Uganda as a volunteer and this became a refresher course for me from Sadguru himself. I shared with Sadhguru the fear I had of hurting my hip (during his meeting with the volunteers) but he encouraged me saying "it's time to begin slowly again.” Indeed, I began. Today on IDY, I had an amazing session at 5.30AM, and when I got up from my mat, ALL my hip pain had vanished. I had a very calm and productive day. My leg is so strong, NO pain at all. I am completely healed and feel confident to even kick up in the air!! My workmates say for the first time I was glowing and not looking sickly as I have been. 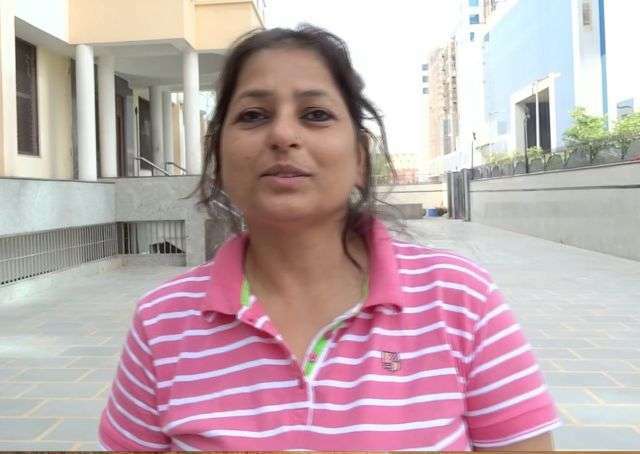 “I went from Vidisha to Udaipur to do an IDY training for schoolteachers. After changing 3 trains, I reached there at 8am. The session was due to start at 9am. I quickly freshened up, did my practices, and went to the venue, only to find a totally unexpected situation – very challenging and different from other Isha programs. The teachers seemed quite agitated as not only were they asked to come for the Yoga session on very short notice, it also took them a lot of time and effort to find the venue. They all came from outside Udaipur, after traveling in buses or trains in 50 degrees’ temperature. So when did I did “Namaskaram” to them to start the session, the first question was when would it end? Could we not just hand over the CDs to them and let them go? Why so much discipline? So many questions were thrown at us. We found out that the mobile phone is no longer an instrument of convenience – it’s become a part of many people. In the middle of the session, some continued to take selfies, photos, etc. Finally, after much persuasion and tactics, we got them to settle. But then, after some time the electricity went off, and pfff! The restlessness was back with a vengeance. I thought to myself that this might be the only session in the history of Isha where people just walked off. But the other volunteer with me didn’t lose hope, and started telling them why we were there and giving answers to questions: What is Isha? Who is Sadhguru? What is the purpose of this whole exercise? Why did the government have to call them here on such a short notice? “This is the first time I was in a program as a volunteer. I have done my Inner Engineering & came for INSIGHT at the Ashram, but this experience was unique in its own way. Meeting cops in a different avatar, surely adds to the experience. But I think the most beautiful part was this feeling that Isha is not only creating awareness for yoga but giving basic training to create teachers to teach Upa-yoga to others... that too in a police department! I think it is a wonderful way to make a real difference. I was feeling very proud to be a small part of this effort! #20 Even ice-cream sellers caught onto the yoga buzz! 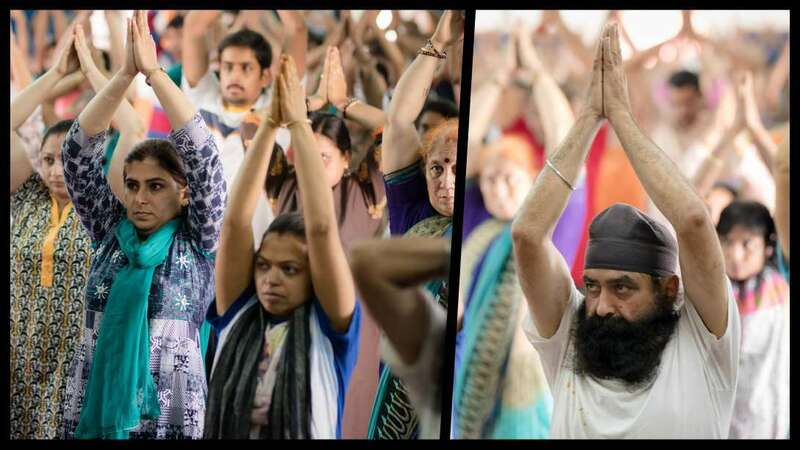 Many volunteers who have been touched by Sadhguru or an Isha Yoga program, ditched their Sunday routine and spent the day at London parks yesterday to mark the UN-declared International Day of Yoga. Isha Foundation had an official presence at both London-based IDY events, one at Potters Fields near the iconic Tower Bridge, and one at Alexandra Palace. Two Isha teachers took to the stage at Potters Field in the afternoon. A combination of timely passers-by and curious yogis listened to an introduction about Sadhguru and the Isha programs that are available in the UK. An enchanting IDY video, made by Isha Foundation, was played at full blast and captured the crowd’s undivided attention - even the security staff and the ice-cream sellers watched! #11 Have A Yoga Break! 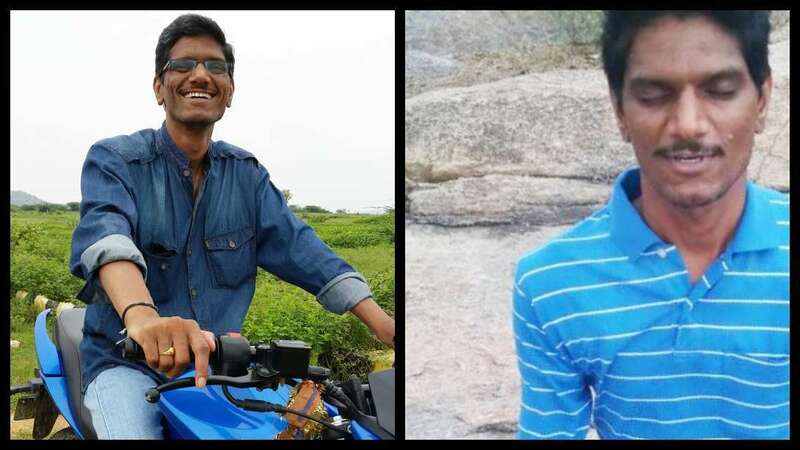 About 2000 engineering students from Vellammal Vidhyashram Group of Colleges in Tamil Nadu had a break that was not of coffee, movie or bathroom – it was an organic indulgence. ‘I feel alive,’ said one of the animated students after the Upa-Yoga session. “I can’t squat!” “My leg pains!” “Can I use the pillow!” were the words I heard during the Yoga Namaskar session. I couldn’t believe I was hearing 10-year-old children saying these things. I expected them to joyfully jump down, squat and jump up. Some children just quit doing the process. When the resistance grew louder, I paused the session, and asked the children their age. All of them were just between 10 and 12 years old. I showed them how easily I was able to sit and inspired them – ‘I am the one who is 10 years old, you are sounding like 50 year old men and women!’ As the process continued, their focus and concentration increased and they quietened and could do everything. #8 Duchesses in a Twist! 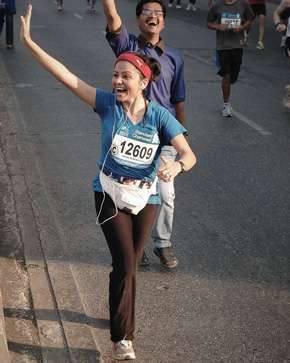 “Most participants were in hurry to go home as it was Friday and the time was 5.30pm. However, we clearly noticed as the session continued, they got totally absorbed and were very receptive. In the end, it was amazing to see the joyfully surprised faces as most of them thought it would be some kind of exercises.” – Isha volunteer. 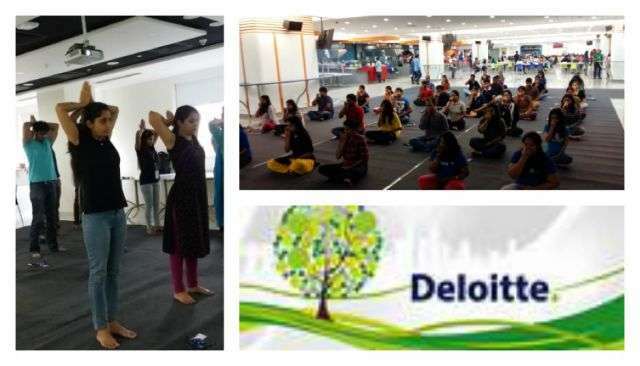 Isha conducted five sessions at Deloitte, Hyderabad for 222 executives. - In another school with no equipment, a teacher and a couple of students rigged up the speakers and TV from old electronic equipment from their homes. The children were intrigued by their teachers’ enthusiasm and participated whole-heartedly. “We were looking for something that would help us make our children more focused in life, and experience peace and happiness. This evening, the 1.5 hours were really enriching. I see this as just the beginning. I feel sure that it will change the lives of the children, and ours too.” – Sister Sagaya David, St. Catherine’s Home for Destitute girls, Mumbai. The orphanage has been running for 94 years, and takes cares of children irrespective of caste, creed and community. “At one point I wondered if these students were really interested in learning yoga or they were just coming because their teachers told them to. Within a couple of hours, I had my answer. I was standing outside the hall after the session and was discussing something about next week’s sessions with my fellow volunteers. A student came to me and asked about the cost of the Upa-Yoga CD. When I told her, she opened a tiny purse, took a Rs.10 note and some 1-rupee coins and bought the CD. I realized how immature I had been to think what I did. To account for the CD sale, I asked her name. 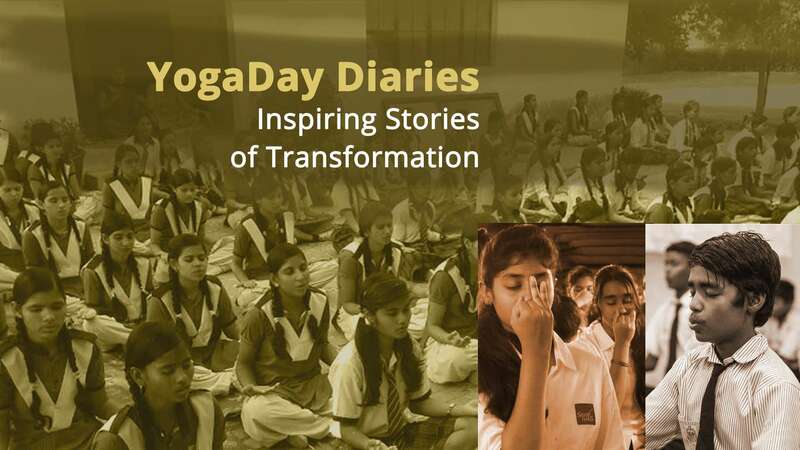 ‘Sirajunnisha’, she replied.” – Jyoti Basu, volunteer who conducted IDY sessions for 2000 students at National Garodia School, Hyderabad. #1 No One Has Ever Come to See Us Before!